Marketwatch gathered some of Farrell's more famous observations, and republished them as "10 Market Rules to Remember." These rules were also mentioned in a recent Bloomberg story as well as a Big Picture Blog in August. Think of the market baseline as attached to a rubber string. Any action to far in one direction not only brings you back to the baseline, but leads to an overshoot in the opposite direction. 6 years, only to get cut in half. As the fever builds, a chorus of "this time it's different" will be heard, even if those exact words are never used. And of course, it -- Human Nature -- never is different. 4. Exponential rapidly rising or falling markets usually go further than you think, but they do not correct by going sideways. Regardless of how hot a sector is, don't expect a plateau to work off the excesses. Profits are locked in by selling, and that invariably leads to a significant correction -- eventually comes. Investors can be their own worst enemy, particularly when emotions take hold. Gains "make us exuberant; they enhance well-being and promote optimism," says Santa Clara University finance professor Meir Statman. His studies of investor behavior show that "Losses bring sadness, disgust, fear, regret. Fear increases the sense of risk and some react by shunning stocks." Hence, why breadth and volume are so important. Think of it as strength in numbers. Broad momentum is hard to stop, Farrell observes. Watch for when momentum channels into a small number of stocks ("Nifty 50" stocks). I would suggest that as of August 2008, we are on our third reflexive rebound -- the Januuary rate cuts, the Bear Stearns low in March, and now the Fannie/Freddie rescue lows of July. Even with these sporadic rallies end, we have yet to see the long drawn out fundamental portion of the Bear Market. As Stovall, the S&P investment strategist, puts it: "If everybody's optimistic, who is left to buy? If everybody's pessimistic, who's left to sell?" Going against the herd as Farrell repeatedly suggests can be very profitable, especially for patient buyers who raise cash from frothy markets and reinvest it when sentiment is darkest. Especially if you are long only or mandated to be full invested. Those with more flexible charters might squeek out a smile or two here and there. I occasionally crossed paths with Bob when I worked at Merrill Lynch as an analyst. He was strong researcher and true gentleman. Though he may not know me, I got to observe him more when I became a resident of Concord, MA., a gracious gentleman, family man and supporter of his church. He is an example of what we should aspire to be as a finance professional, colleague, friend, and neighbor. I wish I knew him better because I would be better because of it. This is not meant to be a eulogy but just the truth. The stock market has become more range-bound over the last few weeks, but that has not changed the pessimism in the markets. The Yale School of management has produced a relatively long history of stock market confidence by both institutional and individual investors. http://icf.som.yale.edu/confidence.index/CrashIndex.shtml. The chart shows the confidence that there will be no crash in the next six months. This index reached a low after the end of the tech bubble after which there was a strong equity upturn. Sentiment is not very strong as we end the year. Consumer confidence also reached a new low this week so this economy needs a good jolt of optimism to get spending and lending to pick-up. The focus of the credit crisis has been on government provding funds to substitute for the failure from private lending, yet some of the rules and regulations can be changed to enhance private lending and liquidity. The Treasury Market Practices Group (TMPG) may be as important public -private partnership through setting standards in the Treasury market. In particular, suggested changes in the repo market where there has been a significant increase in the number of trading fails may be an important mechanism for normalizing lending in Treasuries. Increased liqudity in the repo market is imperative to better establish a lqiudity for makret maket-makers. This issue has to be solved before the spike in Treasury issuance hits the markets. The new statism from fiscal stimulus will be the major theme of 2009 and there seems little to suggest that thee will be much of discussion on this very relevant topic. The global economies need significant help. This help will not be coming from risk taking by banks or other private means, so governments will be needed to provide counter-cyclical spending. Yet, the form of this spending has not been the subject to much discussion. Some types of government pending will not be structural changes but rather temporary substitutes for private activity. Other actions will be more permanent. Temporary actions are messier because the immediate link between action and spending is unclear. Direct control will be easier to monitor but will have a permanent feel. Right before Christmas we got the bail-out package for the auto industry; however, there is no end game for this process. This is an extension of packages that have begun in other countries. Is there a point where the auto industry is allowed to go bankrupt? This has the feel of a something that could last for years. We have the Fed also engaged in active lending arrangements to substitute for private behavior. How long is this supposed to last? No one knows. We have had the nationalization of some British banks. Again, it is unclear what is the end game. Japan has announced a record budget to stimulate the economy as the latest economic data shows the economy seeing a further nosedive. This my be similar to the type of stimulus that was conducted during the 1990's. State actions are occurring in China which will have an impact on relations with the US. If there is a bail-out of domestic firms which export to the US, will this be considered unfair trade? Within the private sector, many are wondering whether the government is implementing an approach known as guo jin min tui or “the state advances as the private sector recedes”. The Chinese economy is trying to maintain a growth rate of over 8% which is needed to minimize the potential labor unrest issues. It is hard to argue with a move back to statism if the US is not doing the same. Moscow, which has pledged $200bn to mitigate the effects of the economic downturn, late on Thursday published a list of 295 strategic enterprises entitled to preferential government support. Moscow has seen significant deterioration in their exchange rate with the fall in oil prices. Central bank reserves have been used to maintain the currency peg but reserve outflow is significant. There will be increasing state control of trade, domestic industries, finance and commodities which enhance the power of a centralized government. The list can go on, but you get the point. This movement will mean more conflict on trade between countries, less failure of poor companies, and a strong appetite for taxes and debt. Yes, it is needed today but what will be the long-term costs. Laurence Ball, an economist at Johns Hopkins, makes a similar point. " Nobody ever sees anything coming," he says. "Nobody saw stagflation coming, nobody saw the Great depression coming, nobody saw Pearl Harbor or 9/11 coming. Really big bad things tend to be surprises." Asking the question of how economics could do better makes sense as we end the year, but did we really miss the signs of the crisis? I am now of the belief that we knew that a crisis was potentially upon us but we did not want to take steps to stop the behavior that was leading us down this path. We were willing to hope that situations albeit highly improbable would lead to avoidance. We did not want to raise interest rates when the housing market overheated. We did not want to regulate or change the system which was leading to unqualified buyers of homes. No one wanted to say no. So what can we predict for 2009? The unexpected, of course. But, more likely is that any policy changes will attempt to avoid pain. Firms will be bailed-out. local governments will be bailed-out. Consumers will be saved through relevering. Yes, there will be pain but it will be focused on the ignorant and those willing to try and play by the rules and not by those rent-seekers who will try and manipulate the system. There will be no surprises when it comes to human behavior and pain avoidance. The government money fund may be a thing of the past. Net of expenses, the returns on government money funds is currently close to zero and may actually turn negative as current securities roll-off. Some funds have started to lower fees. Others have closed the funds are have begun to get out of the business. The net result will be that investors will start to either move out to riskier assets or move to bank CDs. While not explicit, the Bernanke policy of taking rates to zero will kill the money funds as we normally know them. In scenario one , moving out to riskier assets, the change in portfolio composition will be good for the economy. The flight to quality will be reversed. A simple case would be for the money fund holder to move from a government fund to a general money fund that is holding commercial paper, assets other than Treasuries. A riskier move would be for investors to move out the yield curve to Treasury or corporate bond funds. The final move may be to equities if the perception is that they are less risky by being cheap. The second scenario which can happen at the same time would be a move from government money funds to bank deposits which are federally insured. Money funds have a federal insurance guarantee for a temporary period. This will move money from the shadow banking system to the regulated banking system. My guess is that he government doe not care if money funds are closed and would welcome money moving back to the banking system. But, investors start buying risk assets, who will buy the Treasury bills? We are at year-end schizophrenia in the currency markets. After a strong dollar rally, the market woke-up to the new Fed of quantitative easing. The rate target was set at 0-25 bps and the Fed flooded the market liquidity. In many countries, interest rates are higher so we saw a dollar sell-off as the risk aversion delevering story wound down. The strong move was especially the case for the Euro which moved from 1.26 on December 1st to a high of 1.47 yesterday. Today the dollar dropped below 1.40 reversing much of the gain from the previous day. This is partially liquidity driven but also a reaction to varying moods about global economics. The market has realized that there is no safe haven in Europe even if rates are higher. More bad economic news in France and Italy was announced today and the Geramn IFO survey continued to move lower. The relatively tight ECB policy of holding rates at 2.5% will not last. Yield differentials are not enough to continue capital flows as the race to zero continues around the world. Japan cut rates another 20 bps to a 10 bp target. The Swiss have rates at 50 bps and Canada is hovering at 150 bps. Rate differentials will not figure in these crosses. The dollar sell-off was by many technical measures overdone and with coupled business cycles there is more reason to think that G10 currencies will stay within a range for the near-term. Currency intervention takes many forms but one of the most effective early actions is jawboning the currency lower. The cost is zero as long as you have creditability to back your threat. The Minster of Finance Nakagawa said he is "keenly watching" the yen market and "has the means" to take action. You do not need a translation. He has a big wad of cash and is willing to use it if he has to. The market reaction was swift with the yen falling. This causes speculators to cut positions and reduce their buying. The threat creates two-way trading flows instead of the single direction we have been getting, but there are headwinds which work against a softer yen. The US quantitative easing is pushing rates lower in the US than in Japan. Why should any Japanese investor hold dollars. The flight to quality during a global recession also continues. Financial flows are moving back to surplus countries like Japan. Trade flows have also slowed given the recession in major markets with less exports and imports. During periods of stronger yen appreciation there is a desire by the MOF to help exporters. With weak demand, change in yen values will not effect trade; however, jawboning will slow the direction and may allow exporters to better prepare for an overall stronger yen in 2009. Remember the yen was 110 in August and at 100 at the beginning of the last fiscal year. We are not going to see yen levels above 110 like 2007 for a long time but something closer to 100 would be more acceptable for exporters. The MOF has intervened in the past in the 105 area but the economic environment is much different even if you have the means to move the market. It is easier for a cartel to control prices when they are moving up. You can add supply. If you are unable to increase supply, you are still a winner in a cartel. When prices are falling, you have to cut supply, but the temptation to cheat is just too great. Prices will continue lower. OPEC announced cuts of 9% or 2.5 million barrels a day to 24.845 per day. We will see if this reduction will hold prices steady. This is unlikely if we know how cartels work. Last month countries actually produced about 630,000 more barrel than expected. Russia also said it would cut production but the need for foreign exchange is significant. The oil market is in contango so inventories re building. With global growth continuing to slide lower, it is not clear that the current cuts will control the price. Lower prices have removed the energy consumption tax but this will not be enough to help growth. The Fed cut rates 75 basis points to the lowest target seen since the Fed began using this operating procedure. The reaction was swift with equities and bond higher and the dollar selling off. The Fed will use "all available tools" and do whatever is necessary to help the economy. The Fed was at 1% for less than 2 months and have made 9 cuts in the last 14 months and provided $1.4 trillion in emergency lending. The Fed said it will expand the lending if necessary. The only comparsion for this type of monetary policy is Japan. Money market rates are tightening with all o this liquidity. 30-day CP and 1 moth LIBOR are at or below 1%. One year Treasury bills are at 45 bps and 3-yer Treasuries are at 88 bps. Treasury trading will soon become a one way bet. Rel rates are negative because CPI is at 1.1% ex food and energy at 2%. The CPI monthly change was -1.7%. We are not in deflation but the most recent CPI numbers are showing large price drops. The G3 economies are coupled and that is a global problem. World economic growth usually does not turn negative because most of the business cycles of individual countries are not correlated. There will be a slowdown but not likely a full global recession. For the last 15 years, the engine of growth has been the US economy which has often been immune to the slow growth problems of other regions. With the US in recession, the expectation is that other regions will be able to take up the slack in world growth, yet the G3 are now closely coupled. The US, Japan, and the EU are all in recessions. These recessions are growing longer and deeper in all cases. he US recession will be the worst since the Depression. The EU numbers have seen the steepest fall on record. Japan is moving back to levels that suggest massive help is required. All three countries have deflation fears. CPI in the US showed a strong negative reading. Japan is still registering deflation. The IPS market is suggesting deflation in both. The EU has seen a slide in inflation even though there are no explicit expectations for deflation. There still is a growing bias in that direction and inflation will be below the ECB target of 2%. The monetary policies in all these regions are calling for strong easing. The US is following a de fact quantitative easing . Japan has driven rates back down to zero and may have to again engage in quantitative easing. The ECB has used stronger language concerning worries about about dropping rate below 2%, but the central bank has engaged in providing significant liquidity for the banking system since the beginning of this crisis. Fiscal policy is all stimulative. The US stimulus package will be massive and create a $1 trillion deficit. Japan is looking for added fiscal stimulus to offset the decline in private investment. The EU budget plans have been less aggressive at this point in time but that may only be a function of the surprise turn in the economy. While there is an expectation that growth will come from the BRIC's, they have been having their own problems. The export nature of the Chinese economy means that it is closely linked to the US and Europe. Russia is in the process of currency devaluation because of the fall in oil prices. Brazil has been rocked by the credit crisis in spite of having a strong balance sheet relative to previous emerging market problems. India's growth has also slowed and may not have enough internal demand to affect the rest of the world. There is little joy for the season as we enter the end of the year period. Crass Keynesianism - Should there be another type in a recession? “The switch from decades of supply-side politics all the way to a crass Keynesianism is breathtaking,” Mr Steinbrück said. The German Finance Minister has a good turn of the phrase and makes a good point. We have moved from a muscular capitalism of suppl side cuts to massive government intervention in a matter of months. No one is talking about supply side cuts to solve the current problem. We are now in Keynesian fiscal policy and liquidity trap solutions 24/7. Policy-makers have put their supply side leanings in a dark closest. Yet this activism is not bad in the short run. There are no other choices on the monetary side especially during banking crisis and with interest rates approaching zero. Fiscal policy has more choices but a strong response is necessary. The policies have to be combination of short-run effects which will help consumers to longer-term capital projects; nevertheless, there is need for discussing the end game of unwinding the fiscal policy to ensure there is not structural deficit problem. The important issue is making fiscal policy counter-cyclical and not a permanent fixture of the economy. In the short-run, I will take some crass policy-making. "Fiscal indiscipline" or spending like "drunken sailors"
ECB president Trichet talked about "fiscal indiscipline" and fear that the EU may blow-up the stability and growth pact that sets rules on deficits and debt levels. While Trichet is showing a level of fiscal sanity that is not present with many finance ministers, the situation may be too late to fix through conventional means. It is not clear what is the level of deficit financing that will be ncessary but prudent. Clearly borrowing like drunken sailors may make some countries happy in the short-run but it will place significant strain on the EU. Deficit levels for a number of countries have been hovering at high levels, so a deep recession will cause of significant increase in debt levels. Here we have another fallacy of composition problem. Having any one country run high deficits may not be a problem. Over time, risk premiums would have to increase to compensate investors for the risk but money could be allocated on a relative basis. If Italy issues more debt, the spread on Italian bonds would increase, but given a single currency, money would flow from say Germany to Italy. However, there are complexities if all countries run high deficits. The world will be relevering again except substituting public for private borrowing. The large deficits would crowd-out funds both in the private sector and from countries that have relatively low deficits. It then becomes difficult to define what is the risk free ate of return if the government takes on risky projects that were formerly manged in the private sector. http://www.gold-eagle.com/editorials_01/seymour062001pv.html. Each number represents a new comment of optimism from another famous person during the period. What does it all mean? When we want something to go up, we can blind ourselves to the truth. Negative reality is never something pretty. Should we prepare for the US "lost decade"
Many describe the 1990's in Japan as the "lost decade". After the real estate bubble popped, the stock market went through a precipitous decline. Japan faced a banking crisis and an ongoing problem of nonperforming loans as the the balance sheet of companies and consumers were destroyed. Could we be following the same economic debacle? I would like to believe that we have learned some lessons from the Japanese experience, but when we compare policy choices it seems like we are following many of the same paths. Granted the paths available to policy-makers are limited, but we seem to be employing the same playbook as the Japanese. Our reaction time is faster and we may have a greater clarity on what we can do but we may end with the same fate as our Far East brothers, a long and prolonged slowdown. Some argue that the bubble in Japan was caused by structural change from bank deregulation and monetary easing. These same arguments are being used in the US as the cause for the housing bubble. Loose regulation and monetary easing from Greenspan are viewed as the key ingredients for the current problem. Fiscal stimulus was the main driver for helping the economy after the real estate bubble collapse. The form of the stimulus was through massive public works projects which tried to help rebuild the infrastructure of Japan. This ballooned the deficit in Japan so that total government debt is well over 100% of GDP. The top rating for government debt was lost, and many of the projects took the form of "bridges to nowhere" or pork-barrel spending. Given the high savings rate in Japan, the debt did not crowd out private spending and drive rates higher. Private investment came to a standstill because the banking crisis left many financially poor institutions standing. Fiscal policy as key driver was not effective in solving a liquidity trap issue. The second part of the solution was to help with the non-preforming loan problem. Unfortunately, the banking regulations did not force the closure of institutions and actually allowed banks to carry bad loans for too long. Allowing loans not to be marked down caused massive uncertainty concerning the viability of financial institutions. The US has done a better job of addressing this issue but write-downs and closing of viable institutions has to increase to cleanse the financial system. Using TARP funds to prop-up poor financial institution may not be the best policy response. The Japanese monetary authority pricked the bubble by tightening credit. Once the economic fall-out occurred, the Bank of Japan cut rates down to zero, but this was not enough. The Bank of Japan then began a policy of quantitative easing to re-inflate the economy and to help banks gain liquidity. The policy was conducted on a massive scale but it took years to get liquidity back into the system and allow for some positive growth. Quantitative easing does not work if there is not a change in confidence by financial institutions. We are seeing the impact of zero rates still not causing banks to lend. The lessons from Japan are applicable to the US. The reversal of a bubble takes time. There are no quick fixes in an economy that has to delever. In Japan, the problem took years to fix. The US has the advantage that we can learn from the mistakes and take a number of policy initiatives at the same time as opposed to the Japanese who seemed to work more sequentially. The number one lesson may be to help fix balance sheet for banks, corporations and individuals. In the short-run, this means market to market effectively the assets on the balance sheet. and adjusting the cost of liabilities. What must be avoided is "fallacy of composition" problem. If everyone fixes their balance sheets, then the overall economy is harmed. There are also significant differences between the US and Japanese experiences. First, the US does not have the same problem of population aging which has affected the potential GDP in Japan. Second, the US may have a higher productivity because there is more flexibility in the US economy. Finally, the potential for innovation has been greater in the US. Unfortunately, these are intangible solutions which cannot be easily changed by government policies. If fact, there is the potential for more harm than good through policies which cut productivity or innovation. By comparing Japan's lost decade with our lost economy we can reduce the change of repeating the same issues, yet it looks like we will be following some of the same policy paths. If you want to see how negative are bond investors about the economy, look at the TIPS market. Comparing the break-even spreads between nominal and inflation protected bonds, you will find the view that we should see deflation over the next few years. We may expect this for Japan, but this is unusual for the US. We are not seeing expected deflation in Europe or Canada where there are well-developed inflation protected markets. Five year break-evens in the US market are at -18 bps. Similar break-evens exist for UK IPS. Clearly, the economic problems in the UK are similar in magnitude as the US. The French IPS which can be a proxy for the EU are showing positive inflation. Further out the yield curve the inflation numbers look positive but the US is at the low end of the range after accounting for Japan. The break-even inflation rates are a relative price between nominal and inflation protected bonds so an alternative explanation could be the Treasury bubble story that is making the rounds. In that case, nominal bonds are being driven down in yield as the flight to quality continues. The overreaction to a flight to quality is pushing nominal bonds lower than where the should be. The only problem with this story is why wouldn't the market buy more of the Treasury IPS which have the full faith and credit of the US government. The pessimism story for growth with deflation seems to be the driver with this group of investors. US trade balance was more negative than expected which is very surprising given the significant fall in oil prices. Most would expect that the key fall in imports would lead to some improvement. Imports should also fall with the decline in income. The big surprise was the decline in exports which is telling us something about the state of the rest of the world and it is not good. The major theme in 2007 and early 2008 was the decoupling of the rest of the world from the US. The new economic engine would be emerging markets which were growing independent of the US consumer. That story is gone. The rest of the world is slowing with the US. Now this slowdown is all related to a common cause, the credit crisis, but exports were the one bright spot in the US economy. The poor global story is confirmed by the slowdown in Chinese exports and the fall in Baltic freight rates. If trade financing is not available there will be less trade in goods. Another fall-out from the credit crisis. These numbers will not get better given the season and still early point in the business slowdown from some countries. What is the ECB thinking? ECB member Axel Weber commented today that the central bank should not reduce rates below 2% given the current inflation rate and target of 2.5%. He suggested that the bank should not cut their benchmark rates so that the short-term real rates turn negative. The benchmark rate is 2.5% but much of the G10 is moving to zero as the global recessions deepen. Given that the economic news out of the EU is very poor, this ECB view seems completely at odds with with the Fed. Of course, the sole goal of the ECB is to control inflation so it would not make sense to create negative real rates if they wanted to adhere to their goal, but the EU does need more stimulus. Inflationary expectations are very different in the the EU versus the US. Currently, the US TIPS market is forecasting deflation over the next five years while the EU is showing the inflation protected market at break-evens which are just above 1%. No wonder the EUR is higher after this announcement. The rate differential may actually get wider between the US and EU. The fact that the ECB is out of step with the Fed will be one of the key monetary themes in early 2009.
Who says we do not have quantitative easing? This is the current list of lending programs from the Fed and Treasury from Fox Business News. It is clear that the new monetary regime is quantitative easing. This is the correct policy when faced with liquidity trap, yet it is unclear whether the current size of the program is scaled appropriately. TARP: Troubled Asset Relief Program. This is the Treasury's big $700 billion ($850B including pork) program that has been used to prop up financial institutions. TAF: Term Auction Facility (or TAFfy). Program by which the Fed auctions funds to financial institutions — allowing them to use their toxic assets for collateral. TALF: Term Asset-Backed Lending Facility (or "son of Taffy"). Recently announced Fed program designed to help the market for student, auto and other consumer loans. CPFF: Commercial Paper Funding Facility. Buys commercial paper directly from corporations. AMLF: Asset-Backed Money Fund Lending Facility. Fed program designed to buy short-term paper (including commercial paper) to prevent money market funds from "breaking the buck." TSLF: Term Securities Lending Facility. Fed program that lets banks swap bad mortgage and other debt from their books in exchange for Treasuries. SLF: Special Lending Facilities. Originally designed to loan money to fund JPMorgan's purchase of Bear Stearns in March. Also used to back AIG's balance sheet to avoid total collapse. PDCF: Primary Dealer Credit Facility. This is the Fed program that allowed broker/dealers and other non-banks to tap the Fed's discount window (back when there were independent broker/dealers). In an effort to get ahead of the global crisis, five central banks cut rates today. This was a massive almost simultaneous cut in rates which in many cases was unanticipated. This is still may not be enough as we race to zero with rates around the world. This is big news but you would not know it from the markets. Currency markets were relatively unaffected by the news. Of course, if the everyone cuts rates, the relative interest differentials still stay the same. Currency markets are more focused on business cycle fundamentals. Equity market showed almost no reaction. The reason for the limited impact is that the central banks are following not leading interest rates. In the US, the Fed funds rate is trading well below the target. The Fed funds rate is at 1/16 and the target is at 1%. If the Fed cuts the target, who cares. Overnight deposit rates in Europe are at 2% while the target is at 2.5%. Overnight call rates in Japan are below the .3% target. Overnight deposits in the UK are trading .9 -1.75 which is below the BOE of 2%. In Sweden and New Zealand, short rates have been higher then the central bank target, but the slowdown in the economies suggests that more monetary stimulus is needed. The ECB cut rates by 75 bps to 2.5 from 3.25. The market was expected only a 50 bps cut, but there is only so much bad news an inflation fighting central banker can take. This is the same central bank that was raising rates in the summer because of the inflation from the commodity demand bubble. The EU has been hit with bad new every day. Forecasters have never been ahead of the curve in predicting the European economy in this cycle. They were even behind the curve with the rate cut prediction. So what has been the immediate reaction in the markets. Nothing. Bonds have sold off but not significantly. Short rates are unchanged after a rocky start. Stocks are still off for the day. This is not supposed to happen when you have a surprise cut bigger than expected. The focus may have been more on the words of ECB chairman Trichet, the EU economy would be "dampened for a prolonged period of time" and the "level of uncertainty is exceptionally high". This will throw a wet blanket on any positive response to the rate cut. Comments from Lou Jiwei, chairman of CIC, the SWF of China, suggests that the focus of China will be inward. "If China can do a good job domestically that is the best thing it can do for the world" We should not expect China to use its large wealth build-up to save the West. However, increased consumption in China will be good for the global economy. Lending rates have been cut four time since mid-September. A massive fiscal spending policy has also been announced. Nevertheless, it may not be a big factor in 2009. Internal growth has to substitute for the export revenues of the last decade but changing consumer behavior will take time. Export firms on the China coast have been devastated with declines in orders. We can see the fall-off in global exports when you look at the Baltic freight rates, off over 90% from highs. The currency has also stopped appreciating and has actually seen a reversal in the last few days. A similar slowdown occurred last year after the credit crisis problems in August. Do not expect any currency appreciation anytime soon. China is going to follow its own policies and not be swayed by the G7. Analysts on the sell–side do a better job than buy-side analysts. A recent article in the summer 2008 issue of the Financial Analysts Journal finds that buy-side analysts are more optimistic than their sell-side brothers and sisters and generally do a poorer job then the sell-side, “Buy-side vs. Sell-side Analysts’ Earnings Forecasts” by Boris Groysberg, Paul Healy and Crag Chapman. Interesting! The sell-side is supposed to be in the bag with investment banks so there supposed to be overly optimistic about the stocks of clients which the banks have an economic interest in courting. The numbers prove otherwise with the sell-side being more accurate and less optimistic. Look at their earnings estimates and targets and not on the recommendations. The researchers find that the pressure cooker of Wall Street forces analysts to do a better job. The best and worst on Wall Street are more likely to change jobs. The best move up the letter for better compensation and the worst are forced out of the business. The kinder and gentler buy-side is less willing to eliminate poor performers and may not be willing to pay for top analysts or those analysts get promoted to portfolio management jobs. The economic competitive story makes sense even if more decisions are made by portfolio managers. Now the sample is not for all buy-side analysts but this is an interesting counter-factual result from what may be expected. A downsizing of Wall Street may actually create more market inefficiencies for those who are left standing. There will be less competitive research done on the street because there will be less analysts and less places for good analysis to move to. The buy–side will be more dependent on their research which may not be as good. There will also be less collaboration or competition between buy and sell-side analysts to provide the best ideas to the client, portfolio managers. Investors still need good research. Robert J. Samuelson, the columnist, suggests that fear is the cause of the stock market volatility. Fear can make everyone a seller but it does nothing to help buying. The markets are more complex. Even with strong volumes what may be missing is liquidity. The Option Industry Council reports that option trading while up 28% over last year is actually down 21% for November 208 versus November 2007. The NYSE volume for November was down to the lowest levels since December 2004. Volume is off from the high levels of 2007. Lower trading could be associated with the uncertainty in the market. The result is less liquidity at any price so that there will be more distorted moves, higher volatility and strong down moves matched by quick reversals. The lower volume and liquidity means that there will be greater short-term price pressure effects. Large sell-off seen sell orders come into the market only to be reversed quickly later in the day or the next day. If there is less leveraging by dealers there will be a reduction in market-making. Dealers cannot house positions when there is a price pressure effect move. The greater volatility has a feedback effect. High volatility by itself causes more uncertainty and will reduce volume. If you cannot be certain on the price at execution, there will be less trading. Ambiguity about policy and stock valuation will also reduce volume and cause a lowering of liquidity. Investors are not substituting one stock for another but moving to cash which withdraws liquidity. Fear is not a precise term. A story of liquidity and uncertainty can better describe the poor market conditions currently being faced. The NBER recession dating committee met on Friday and have agreed that the economy peaked in December 2007, so we have been in a recession for just under a year. Now you could have asked a lot a people the same question and they would have answered this question a lot earlier. Should we feel and better or worse now that we have the recession dated? The one thing that is clear is that this recession is already longer than the average of past post-WWII recessions and will be of a magnitude at least as deep as the 1980-81 recession. At least we have a point of measure nd baiss for what needs to be done in terms of fiscal stimulus. OPEC did not agree cut production this week-end. The cartel members could not find common ground and decided to wait until December. OPEC cut production quotas in October by 1.5 million barrels or 5.2% of daily demand. That has had little impact on the oil price decline. There are two major problems. One, the demand decline has taken the market by surprise. The global economies are falling faster than expected and look like they will continue to decline in 2009. Second, and more importantly, OPEC countries have been aggressive with their economic expansion plans and they do not feel like cutting production to stabilize prices. will help with increasing revenues. The classic problem of cartels is that you have cheaters. And there are some major cheaters in the world. Venzeula gains 90% of its export revenue from oil. The majority of government revenue is tied to oil and President Chavez needs every last cent to stay in power. Russia was planning for $95 a barrel oil so they will have to produce flat out to meet revenue targets. Iraq needs the revenue for capital building. Iran has internal economic problems which need more money. We have not even started to discuss the other Arab countries. Right now there is little reason to see prices going up. Let's not forget that oil was $10 a barrel ten years ago. It is now evident that the Fed is flowing a policy of quantitative easing. Unfortunately, they have not been willing to be explicit in announcing there policy change. Now, some may argue that we are premature about making this announcement since the Fed funds rate is still at 1% bu the latest round of Fed announcements of buying commercial paper and MBS and GSE debt is all but stating the obvious. This should not be surprising given that Chairman Bernnake has researched this issue extensively all the way back in 2004 in "Monetary Policy at the Zero Bound: An Empirical Assessment" with Vincent Reinhart and Brian Sack. In that important paper, Bernanke and company discusses the policy alternatives when rates start to reach zero. There are three major policy alternatives, communication, quantitative easing, and balance sheet policies. It could be argued that the Fed is engaged in all three of these alternatives right now. First, the Fed has made clear that they will provide significant funds through a number of programs to provide the market with liquidity. 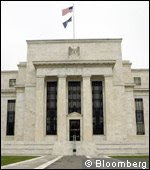 They have also made clear that they are will to provide funds even if this lowers the Fed funds rate below the target. Second, the Fed has engaged in actively increasing their balance sheet through providing lending facilities. It has provided more repo lines, the dealer lending facilities and other programs which have increased the Fed balance sheet to above $2 trillion. They have been providing funds to offset the delevering by private sources. Three, the Fed has been willing to take on credit risk in order to provide liquidity and to affect the yield curve. The outright purchase of GSE debt and MBS is similar to earlier policies like Operation Twist to use its buying power to affect longer-term rates and rates that seem to be out of line relative to historical relationships. The good news is that three prong attack to affect the economy is right out of their policy choices discussed in the 2004 paper. Unfortunately, the bad news is that the impact of these policies may take some time so no one should expect monetary miracles over the next few weeks. The size of the liquidity problem outstrips the impact that was modeled in the 2004 paper. Most of the G7 central banks will have policy meetings in the first half of the December. All of the central banks are facing slowing economies and lower inflation. In fact, there is a growing concern about deflation. The key issue will not be whether there will be easing but how much. This leads to the bigger question of what will happen when you force rates closer to the zero limit bound (ZLB). Now we will not dwell on the deflation issue. Core inflation for most countries are still within their targeted zone after excluded food and energy. Much of the decline in CPI and PPI is a reversal of the short-term commodity spike. The spike was not an inflation problem as much as a price shock issue. It now seems obvious that inflation taregtting is out the window and economic stimulus is the problem. The issue for many central banks is that we still are relatively early within the recession cycle and interest rates are falling to extremely low levels. Major cuts in many of these countries will take short rates down to levels where there will a concern about what some have called the ZLB problem. What are the policy choices of the central bank if we you are or approaching zero interest rates? The problem is facing a number of central banks this month. Japan has seen a growing decline in economic growth. Rates are at 30 bps and have limited room for further decline after rates were cut 20 bps in October. The Fed has rates listed at 1% but another Fed cut is expected to bring the Fed funds target down to 50 bps. The Fed funds rate is already trading below one percent. The Fed seems to have changed to a quantitative easing policy. The Swiss National Bank has a target rate set at 1% but will meet again in December under a declining environment. Bank of Canada has argued earlier that the economy is still doing ok, but the tight relationship with the US and its commodity focus will place further pressure to lower rates. Bank of England is behind the curve with an economy that is growing worse every month. The same could be said for the ECB. Expect to see further rate cuts across the board but there will be more discussion about quantitative easing and non-standard monetary policy. We know the global economies are in recession so there will be more focus on what will be the monetary and fiscal stimulus alternatives in the coming weeks. The equity markets will sell-off on anything other than strong easing. In the depth of the Japanese "lost decade", the Bank of Japan changed monetary policy to try the radical approach of quantitative easing. It actually was the only alternative to a liquidity trap from a deflationary environment where rates were at zero. The Bank of Japan had moved to zero interest rates in March 1999, but the policy of just keeping rates at zero was not enough. The BOJ Quantitative easing set current account balances, the equivalent of excess reserves, to a quantitative target which would be maintained until CPI was greater than zero on a year over year basis. The policy started on March 2001 and lasted until March 2006. The current account balance initially moved from 1 trillion yen to 5 trillion yen, but the target was increased nine times from from March 2001 to December 2004 for a target pf 35 trillion yen. The Fed seems to be on similar path so it seems important to discuss whether the BOJ quantitative easing was a success. The answer is that its success was only marginal. First, the size of the increases was much larger than anticipated and the impact of trying to stop deflation took longer than expected. Investors in the US should recognize that there will not be an quick fixes even if we have started quantitative easing much sooner than the Japanese. Studies of the Japanese financial markets show that the the BOJ easing was able to effect longer rates and bring them down slightly. However, empirical studies suggests that a 10 trillion yen expansion was able to only bring down three and five years interest rates by less than 20 bps. There will not be a significant reduction in US rates if we use the Japanese case as a benchmark. The BOJ found that there was no overall stimulation of lending from their quanttitive easing. Research did find that the easing policy reduced the standard deviation of CD rates across Japanese financial institutions. That is, the lower quality financial institution were able to reap a benefit from the increased reserves. However, some have concluded that the lowering of risk for those firms of lower quality actually delayed structural reforms. Poor institutions lasted longer than they would have until normal policies. The Fed is moving to quantitative easing but it is not clear that this will be a panacea for all what ails the US economy. Now there may be limited choices and quantitative easing may be the only alternative, but this alternative does not mean that we will have a quick cure to our problems. The Fed has taken steps to directly buy up corporate assets through the high quality and ABS commercial paper markets and through GSE mortgage debt. The Fed rationale is to unlock the liquidity crisis in the short-term lending market and try and push down mortgage rates. The objective of the Fed is to provide liquidity while taking a minimum of credit risk. We thought the mortgage purchases were going to be a TARP objective but things change but that is another issue. These purchases, which promote the quantitative easing Fed policy, could lead to unintended consequences. If the Fed is willing to finance all of the good quality assets which are rated A1/P1 how is poorer quality paper going to be financed? There are only two choices. The firms of lower quality will have to go under or they will have to find a price that will entice buyers of the paper. The Fed will crowd out the banks for higher quality paper which will have serious portfolio balancing effects. So who are the potential buyers of lower quality financial paper? They will either be money market funds or banks. Both these groups have either a back-stop or deposit insurance but it comes at a cost. Deposit insurance does not mean that banks and money funds are going to take on riskier credits. Money funds will take on any asset which has the potential to break the buck for the funds. So what are the alternative scenarios for the banks? They could buy this lower quality paper and have it become a larger portion of their loan portfolio or they could walk away from the market and take deposit reserves at the Fed at the Fed funds rate. The first alternative could hurt earnings and equity. This will force banks to take capital from the Treasury and thus loss control of their firms. The second alternative allows for positive earnings while still maintaining control of their institutions. Credit risk is limited. The choice seems simple. There will be less lending to those who may need it most at any price. A two-tiered system of Fed lending to high quality firms and no lending to those that do not meet the Fed criteria will further develop. There is no solution in the short-run for this problem if the objective is to solve the liquidity crisis as quickly as possible.